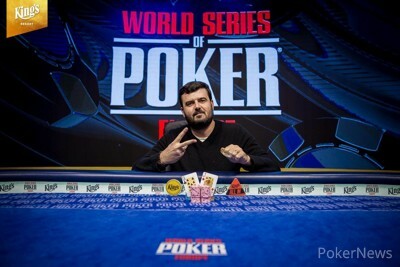 Timur Margolin has been crowned the winner of Event #5: €1,100 MONSTER STACK No-Limit Hold'em at the 2018 World Series of Poker Europe. Margolin took home the hefty sum of €134,407 and his second bracelet of the year after winning one in Las Vegas this summer. He overcame a strong field of 666 players and heads up, he defeated Raul Villarroel, who had to settle for €83,042. With this being only the fifth bracelet of the series thus far, the Israelian contingent has claimed more than half of the titles thus far with three. Margolin picked up his first taste of victory in Las Vegas at the WSOP with a win in the $2,500 No-Limit Hold-em event for which he pocketed more than $500,000. Margolin also joins Hanh Tran as the only players to win a bracelet in Las Vegas and in Rozvadov in the same year. Margolin was presented the WSOP gold bracelet by King's Casino owner Leon Tsoukernik and had this to say about Israel winning its third bracelet of the series. "Amazing, it feels awesome. I was sitting at home watching the live stream and seeing what the boys were doing so I said I have to come to King's Casino. This was the first tournament I played here and managed to bink it." Fourteen players began the final day in the MONSTER STACK tournament and Luiz Antonio Duarte Ferreira Filho started out as chip leader. His father, Luiz Ferreira, started the day as the short stack and ended up as the first player to bust out of the tournament. Ferreira got his last 15 big blinds in the middle with ace-ten, but that was no match against the pocket queens of Mario Llapi. Ferreira flopped best on the king-queen-jack board, but it was all over for Ferreira when the board paired on the turn. Duarte himself was the next one to be sent to the rail. He had a brutal start to the day where he didn't manage to win any of the big pots he played. Duarte lost his last chips when he got it in with ace-four against the ace-jack of Mykhailo Gutyi and the board ran out clean for Gutyi. Alexandre Viard (12th place - €6,949) and Andrei Konopelko (11th - €6,949) also missed out on the final table. Viard got eliminated in a tough spot where he got it all in with ace-jack against the ace-jack of Llapi. Llapi's ace-jack was suited and he managed to hit his flush on the turn to eliminate Viard. Konopelko lost with queen-eight suited against the ace-nine suited of Michal Mrakes. The board ran out clean and Mrakes took down the pot to eliminate Konopelko with just ace-high. The unofficial final table was reached and Dhawal Lachhwani had to miss out on the official final table after getting it in with ten-eight. Sebastian Ulrich was holding king-queen, which held up to send Lachhwani out in 10th place for €6,949. Llapi started the day out strong but he was the next player to go in ninth place. He pulled off a miracle win with ace-jack of clubs earlier in the day, but he wasn't able to do it one more time as he had to win against the pocket aces of Henrik Brockmann. 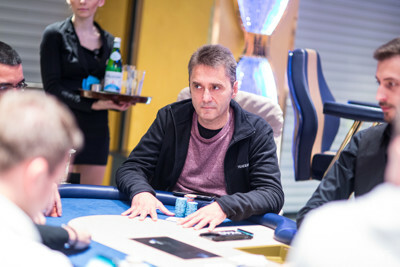 Llapi flopped a gutshot on the king-queen-five board, but the eight on the turn and seven on the river meant Brockmann's aces were good and the Italian player collected €8,920 from the payout desk. The rate of eliminations was pretty rapid once the final table was reached. 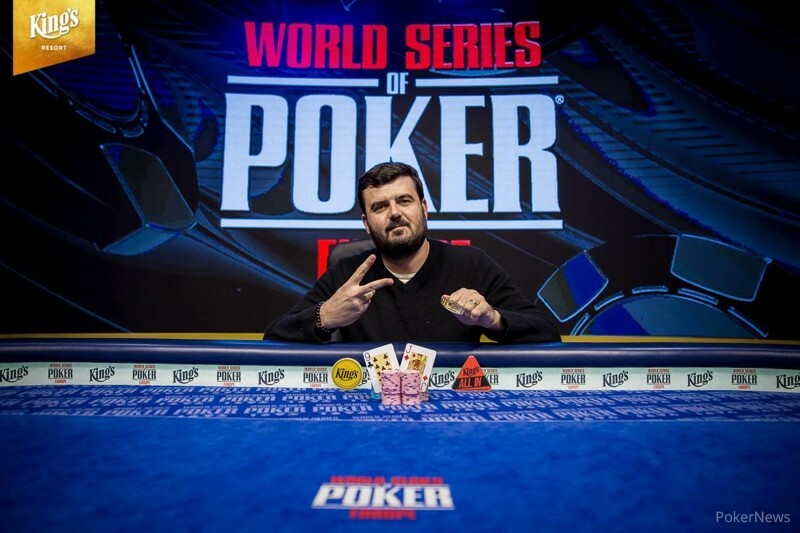 Amar Begovic from Bosnia Herzegovina busted out in eighth place after finishing last in a three-way pot. The board read jack-ten-seven-jack-ten. Michal Mrakes took it all with queen-jack, and Begovic finished in last place with his eight-six and was eliminated. 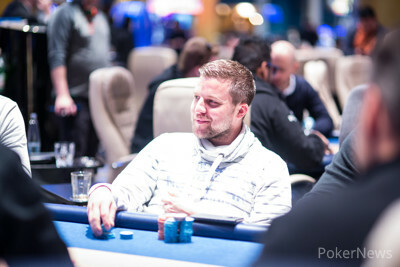 Begovic's finish was good for the first five-figure payday at the final table as he collected €11,656 for his efforts. It took about an hour for the next player to be sent to the rail. Tamas Szunyoghy moved all in for a bit over 13 big blinds with queen-ten, but small blind and eventual runner-up Villarroel woke up with ace-queen. There was no help for Szunyoghy and Villarroel took down the pot. Szunyoghy finished in seventh place and he cashed for €15,502. Gutyi was the next player to go in sixth place. Gutyi had less than ten big blinds when he got it in the middle with king-jack against the king-ten of Ulrich. He was well ahead and the jack-nine-seven flop gave Ulrich some additional outs with the double gutshot straight draw. The queen on the turn was one of the outs that Ulrich was looking for and the deuce on the river didn't change anything for Gutyi. He got to collect €20,974 at the cashier for his efforts. Mrakes was eliminated only fifteen minutes later in a coin flip. Mrakes got it in with queen-nine against the pocket fives of chip leader Margolin and found no help from the board. Mrakes, who is a regular at the King's Resort & Casino, ended up in fifth place, banking €28.863. At this point of the final table, Margolin had a big chip lead with about fifty percent of the chips in play in front of him. Margolin showed no sign of slowing down and he claimed his next victim in Brockmann. Brockmann was all in for his last 9.5 big blinds with ace-ten and he was behind against the ace-queen of the unstoppable Israelian. It was no surprise when the board ran out in Margolin's favor and Brockmann collected €40,388 for his fourth-place finish. Only a couple minutes later, Margolin claimed another scalp. Ulrich checked his option from the big blind with seven-four after Margolin had limped from the small blind. The flop came down queen-queen-nine and Margolin lead out for 200,000. Ulrich called and the turn brought another nine. Both players checked this time and the river brought an ace. Margolin lead out another time with a bet of 375,000 and Ulrich moved all in for his last 2,675,000, only playing the board. Margolin ended up calling and he took down the pot with a full house, nines full of queens. 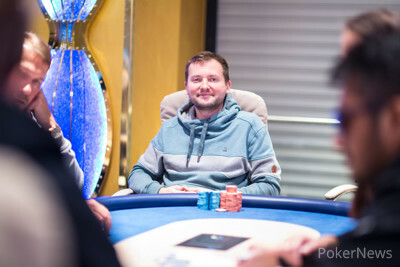 Ulrich took home €57,447 as the third-place finisher. Villarroel was well behind during the heads up as Margolin started with an 8:1 chip lead. Still, it took over thirty minutes for Villarroel to lose his last 14 big blinds. He ended up shoving it in with pocket sevens and it was a flip against the jack-nine of Margolin. The king-four-three flop was safe for Villarroel, but the nine on the turn gave Margolin the lead. It was all over and done with an eight on the river as Villarroel collected €83,042 for his runner-up finish. The PokerNews live reporting team will be back tomorrow with another full day of coverage. The final table of Event #6: €1,650 Pot-Limit Omaha/No-Limit Hold'em will be featured on the live stream with plenty of action on the main floor as well, so be sure to follow all the updates. Timur Margolin shoved all in on the button with and Raul Villarroel snap-called for his last 2,400,000 after looking down at the . It was a coin flip for all of the marbles with Villarroel needing to hold with his pocket sevens in order to stay alive. The flop came and Villarroel still held on to the lead for the meantime. However, the on the turn gave Margolin a pair of nines to take the lead. 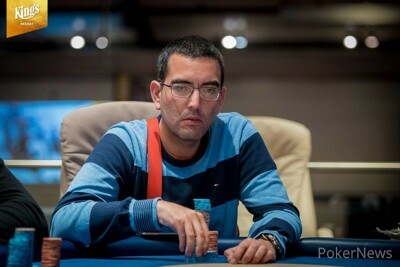 The river was the and Villarroel was eliminated in second place for €83,042. Timur Margolin has been constantly applying pressure to the small stack of Raul Villarroel. With a couple of preflop raises and some post-flop continuation bets, Margolin has extended his chip lead. In the first hand of heads-up play, Timur Margolin shoved all in on the button with . Raul Villarroel instantly called for his last 2,500,000 after looking down at . Villarroel was in a dominating position heading to the flop of . The on the turn left Margolin drawing to just three outs to bring an end to the MONSTER STACK. However, the on the river ensured Villarroel a full double up and the action continues. Timur Margolin limped in with in the small blind and Sebastian Ulrich checked his option with in the big blind. The flop came and Margolin led out for 200,000 which Ulrich called. The turn brought the and both players checked to the on the river. Margolin led out for 375,000 and Ulrich shipped all in for his last 2,675,000 when he was just playing the board. Margolin asked for a count and eventually made the call with his full house. Ulrich took a stand against the chipleader but ran into the goods. The German headed out in third place and the final two players are taking a small break before play resumes. Timur Margolin opened to 400,000 from under the gun with and Henrik Brockmann shoved all in for his last 1,900,000 on the button with . The blinds folded and Margolin quickly called to put Brockmann at risk. The flop came and Margolin's ace-queen was still in a dominating position. The on the turn left Brockmann drawing to just three outs. The on the river was no help and Brockmann finished in fourth place. Raul Villarroel raised to 480,000 out of the small blind with and Timur Margolin defended from the big blind with . The flop came and Villarroel led out for 440,000 with his flush draw. Margolin called and the landed on the turn. Villarroel fired another 900,000 but Margolin continued to call. The paired the board on the river and both players knuckled the table. Margolin scooped another pot after Villarroel missed everything. "You're killing them left, right, and center," Sebastian Ulrich said from across the table. Timur Margolin opened to 320,000 from under the gun with and Michal Mrakes shoved all in for 2,130,000 from the cutoff with . The action quickly folded back to Margolin who asked for a count and then made the call. The flop came and Mrakes picked up some counterfeit outs. The on the turn was no help to Mrakes and the on the river sent Mrakes to the rail in fifth place. Only 14 Players Remain in MONSTER STACK, Who Will Come Out on Top?